Of all the messages scrawled or printed on signs at Saturday’s March on Washington, this yellow, homemade sign struck a major chord with me. “Love is too big to fail” perfectly embodies the spirit of the late Dr. Martin Luther King’s historic message 50 years ago. Hearing the speeches and feeling the unity and love at Saturday’s march left me motivated to be better and do better. Watching snippets of today’s news reports as several U.S. presidents and King family members stood in the spot where Dr. King and others stood on Aug. 28, 1963 made we want to be better and do better. Sharing the experience of the 50th anniversary of the March on Washington with my 23-year-old daughter made me want to be better and do better. Imani and I decided more than a month ago to attend the march together. She was still reeling from the not guilty verdict handed down by a Florida jury in the death of Trayvon Martin. For Imani and others in her generation, this verdict served as a wake-up call that even in 2013, black men are often marginalized and criminalized. For me, the march was about reconnecting with the spirit of our ancestors, who were willing to die for their convictions. People like Congressman John Lewis, who told his mother that he was acting according to the dictates of his conscience when he decided to join the Freedom Rides in 1961 as a young college student. The day of the march, I got up at the crack of dawn, too excited to sleep. People were already gathering outside our hotel to march to the National Mall. By the time we arrived around 8 a.m., the mall was already jammed with people. And what a sight to behold: people of all ages and races coming together, talking to one another and smiling broadly. The pride was evident. We came together in peace and harmony. There were people on walkers, children in strollers and people carrying gigantic signs promoting labor unions; decrying racial profiling and calling for an end to discrimination. Images of Trayvon Martin were everywhere — on shirts, caps and signs. 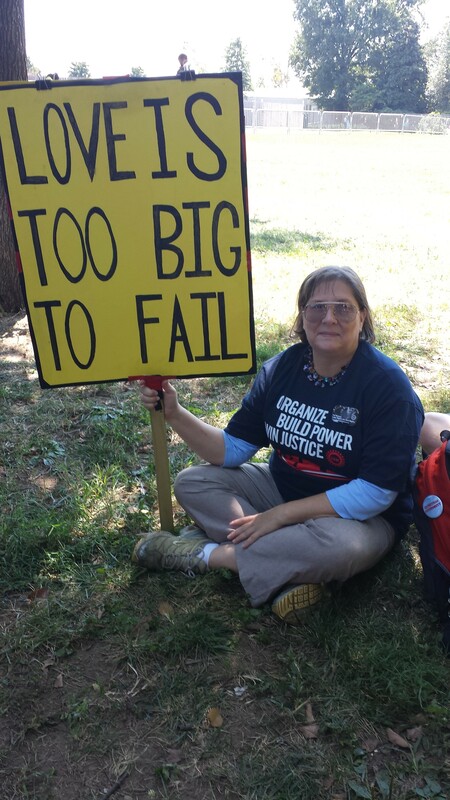 As the march was winding down, we ran into Sheri Morgan, who was carrying the “Love is Too Big to Fail” sign. Her son Thomas made it three years ago for the Occupy Movement. Thomas, now a college student in Los Angeles, got into social justice when he was middle school. He memorized Dr. King’s speeches and often quoted them in their Greencastle, Pa. home. Dr. King’s message of non violence was rooted in the biblical principle of loving your enemies. His models were Jesus Christ and Mahatma Ghandi. On more than one occasion, the students and adults trained in non-violent social resistance shocked their tormentors. The late Pauline Knight-Ofosu was a student at Tennessee State when she decided to join the Nashville Student Movement in 1960. She believed God called her and other students for that purpose. When a young man spat on her during one of the protests, she wiped it off and smiled back at him. Her action so disarmed him he felt true shame at his act. Now if that’s not love too big to fail, I don’t know what is. This column is dedicated to the memory of my friend, Pauline Knight-Ofosu, who died in March. We miss you terribly Miss Pauline. Rest in Peace! My friend Rosemary posted this on her Facebook page yesterday. The three words reminded me of something the Rev. Dr. Bernice King said her mother, Coretta Scott King, was fond of saying. Freedom has to be won anew by every generation. It’s a powerful thought to ponder in a year where we’ve seen a nagging truth on display in a Florida courtroom in the trial of George Zimmerman. In the end, a jury decided Zimmerman’s right to use his gun in self-defense outweighed Trayvon Martin’s right to walk home from a store in his father’s gated community. In the same month, a key provision of the Voting Rights Act was repealed by the U.S. Supreme Court. The parallels of 1963 and 2013 are uncanny. Perhaps its why I can’t sleep this morning. I am in Washington, waiting for the march to commence. In 1963, leaders called it the March on Washington for Jobs and Freedom. In 2013, the March on Washington is still about jobs and equality. It is also about education. To be sure, personal responsibility plays a huge role in the outcome of one’s life. Every man, woman and child must assume that responsibility for their own future. But when drugs and violence continue to flood our communities, that can’t happen for everyone. When young black men in prison outnumber those in college, that absolutely cannot happen for all people. When efforts to level a playing field that has been woefully lopsided for generations are repealed or marginalized, all people will not realize freedom. In 2013, Jim Crow exists in the form of mandatory sentencing laws that result in longer sentences for black men. Jim Crow plays out in attitudes that say a child can’t learn because of the circumstances he or she is born into. Today, the National Mall will once again be filled with black and white people who believe Dr. Martin Luther King’s “I Have A Dream” speech may one day be reality. In it, Dr. King envisioned a world where his four children would not be judged by the color of their skin but by the content of their character. And since we are dreaming, let’s imagine George getting to know Trayvon and realizing they have more in common than either of them realizes. Perhaps George will see Trayvon as a human being with loving parents and dreams for his future. A college degree. A wife and children. Grandchildren. A long and happy life. That’s what Dr. King meant when he said his dream was deeply rooted in the American dream. So today, 50 years later, we march. For jobs. For freedom. For judgement based on character rather than skin color. It’s 6 p.m. and we’re still in church? Juanita, this one’s for you and Natalie! It’s Sunday afternoon and I’m in the mood for a little comic relief. The video clips below bring back memories. I love black churches. I have attended them all my life. My daughters, however, aren’t feeling the two- and three-hour services that are traditional in some black churches. As their mom, I don’t care where they go to church, as long as they are living their faith in their daily lives. My parents made sure we were in Sunday School and church every Sunday. My mother told my sister and I that if we partied on Saturday night we were going to church on Sunday morning while living in her house. Looking back on it, I’m glad my parents took us to church. They didn’t send us, we went as a family. Sure there were times I didn’t want to go, but I cherish those memories of church and the firm foundation of faith we established. As a teenager, I looked forward to choir rehearsals, revivals, youth meetings and summer camp with Juanita Greene! There was Christian Youth Fellowship every Sunday evening, followed by a softball game, tennis or a trip to Baskin-Robbins. Back in those days, ice cream cones were less than a dollar. I understand why young families don’t want to stay in church all day or be there every day. And I don’t think God is counting how many minutes we spend in church. We all know people who spend every waking hour at church but don’t behave like Christians. Hello somebody. Black churches have been a constant force in our lives. We go to church to fellowship with other believers. Yet we can all remember those funny times in church. Happy Sunday ya’ll. Actor and stand up comic Gary Owen so right in this clip. LOL. Here’s another classic from Steve Harvey about going to church every day of the week when he was growing up. I can’t forget my Omega brother Ricky Smiley. You can tell he spent a lot of time in black churches growing up. In this clip he talks about emotions overflowing. That reminds me of the time I was hit in the leg by a friend who started shouting while wearing platform shoes. After that, I always kept my distance from Reggie. LOL. Fair warning, you may be on the floor after this one. This week has been too intense for words. Hundreds of people have been killed in Egypt. Lives are hanging in the balance in various criminal trials. Friends who lost their jobs are contemplating their next career moves. It’s time for prayer. I’m going into my quiet space to commune with my Lord. He is the only one who can cleanse our minds and hearts and make everything new. He holds the master plan for our lives. I am praying for healing and peace. I am praying for the leaders of our world and for people who boldly risk their lives for their beliefs. Think about that for a minute. Is there anything you’d be willing to die for? My friend who lost his job yesterday said he is trusting God for the next door to be opened. He is believing what’s behind that new door will be better than anything he ever dreamed. He is believing God will give him as far as he can see — and then some. I’ve not yet experienced a job loss. But I’m wise enough to know that could change at any minute. No matter how good we are on our jobs, companies are looking at the bottom line. IF profits aren’t where they want them to be, cuts are made. We can be on jobs for decades and go in to work Monday to a pink slip. Notice I didn’t say our jobs — they are the company’s jobs to offer and to take away. Our skills and abilities can’t be taken away. We will always have those. Another friend is doubting herself as she prepares to re-enter the work force after taking several years off to tend to her family and volunteer in her community. She wonders how the dreaded gap on her resume will look to employers. She worries about starting fresh in her 50s. Smart companies value the work ethic older employees bring to the jobs, in addition to their varied skills. She hasn’t been on anyone’s payroll but she’s continued to use her leadership, collaboration, communication and organizational skills. The manager who hires her will be getting an outstanding employee. Amen. Take a moment to encourage someone today!